The Path of the King is a travel through historic events that traces a band of gold as it is passed from a young Viking to Abraham Lincoln. The following is a quotation from its original publication (AL BURT COMPANY PUBLISHERS, 1921): "We wonder that so great a man as Abraham Lincoln should spring from humble people but who knows what his more distant ancestry might have been In a series of dramatic chapters Mr Buchan tells what he imagines to have been the ancestry of Lincoln The worthy son of a northern chieftain who had come down with his people into Normandy, a Norman knight who fought under Duke William and settled in England, a French knight emissary of Saint Louis to Kubla Khan, a proud demoiselle friend to Jeanne d Arc, a French gentleman who went with Columbus on his second voyage, an avenger of Saint Bartholomew's Day, a friend to Sir Walter Raleigh, a supporter of Cromwell, a soldier of fortune under Marlborough, a mighty hunter in Virginia, all these says Mr Buchan were Lincoln's forebears Their blood ran in his veins and made him in James Russell Lowell's phrase the last of the kings." According to Wikipedia, "John Buchan, 1st Baron Tweedsmuir (26 August 1875 11 February 1940) was a Scottish novelist and Unionist politician who served as Governor General of Canada. 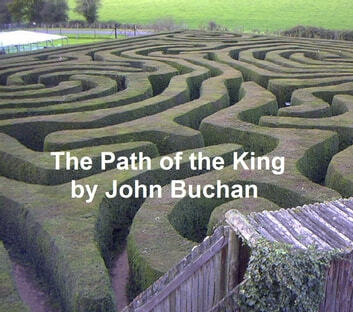 Buchan's 100 works include nearly thirty novels, seven collections of short stories and biographies of Sir Walter Scott, Caesar Augustus, and Oliver Cromwell. Buchan's most famous of his books were the spy thrillers (including) The 39 Steps (which was converted to a play as well as an Alfred Hitchcock movie starring Robert Donat as Richard Hannay, though with Buchan's story much altered.) The "last Buchan" (as Graham Greene entitled his appreciative review) was the 1941 novel Sick Heart River (American title: Mountain Meadow), in which a dying protagonist confronts in the Canadian wilderness the questions of the meaning of life. The insightful quotation "It's a great life, if you don't weaken" is famously attributed to Buchan, as is "No great cause is ever lost or won, The battle must always be renewed, And the creed must always be restated."